CHIANG MAI, Thailand – Works by 18 established and emerging artists from Southeast Asia offering their personal experiences of global migration, notions of identity and ongoing humanitarian crises in Myanmar are on currently on display in a group exhibition in Chiang Mai, northern Thailand. The contemporary art exhibition “Diaspora: Exit, Exile, Exodus of Southeast Asia” is open to the public at the MAIIAM Contemporary Art Museum in Chiang Mai from March 4 until Oct. 1. It includes works in a range of media, including paintings, paper cut-outs, other visual arts and mixed-media installations. Artists from Myanmar, Thailand, Cambodia, Laos, Vietnam, the Philippines, Indonesia, Japan and Australia are participating. At the opening of the exhibition on March 3, panel discussions were held in which the artists shared their experiences and thoughts. The discussion was led by exhibition curator Lorendana Pazzini-Paracciani, a writer and lecturer in contemporary Southeast Asian art. “War Zone in Kachin State and Northern Shan State” comprises two paintings from “Missing Archives”, the artist’s ongoing series dealing with what he describes as unrecorded moments of the ongoing war in northeast Burma. The second element, the painting “Shan State Army” (2017), depicts his imagined impression of the ethnic Army as it existed in 1964. Sawangwongse Yawnghwe was forced into exile from his home with his father Chao Tzang Yawnghwe (or Euguen Thaik) at the age of 1, almost a decade after the 1962 military coup. He lived in Chiang Mai, Thailand, before migrating to Canada at the age of 12. His art works are rooted in personal experiences and spotlight the ongoing humanitarian crises in Myanmar. Through his work he advocates for the recognition of minority groups’ identities. During the panel discussion, he shared memories of his early childhood as a descendent of a Shan Saopha (ruler) who was ousted by the Burmese military dictatorship in 1962, and of his father. “In my case, as an immigrant, one is shamed by poverty, by the traumatized father and mother. … Our roots are ripped out… the place I left is no longer the same and I am no longer the same,” he told the audience. During the panel’s discussion, he highlighted the government’s oppression of journalists and the plight of “over 600,000 Rohingya” sheltering in Bangladesh, referring to the displaced Muslim populations of northern Rakhine State who have sought refuge over the border, following the Arakan Rohingya Salvation Army’s attack on 30 security posts in Aug. 25 and the subsequent clearance operations by the Myanmar military, or Tatmadaw. Sawangwongse Yawnghwe also discussed his Yawnghwe Office in Exile, which works with young people in Myanmar and consciously addresses politically contentious historical events through visual exploration. The show also features works by Myanmar visual artist and filmmaker The Maw Naing, whose installation made from 25 colorful nets titled “The In and Out of Thin Layers” is displayed in the main hall of the museum. The Maw Naing told The Irrawaddy he wanted viewers to be able to participate in his artwork; to touch it, to feel it and to interact with his installations of mosquito nets, which are in colors of white, pink, black, grey, and red. He developed the original concept for a work using nets in 2006, but was not able to exhibit his art under Myanmar’s then-ruling junta. But he managed to use the idea in his 2014 film “The Monk”, which incorporated meditative practice in the nets and has been shown at international film festivals. 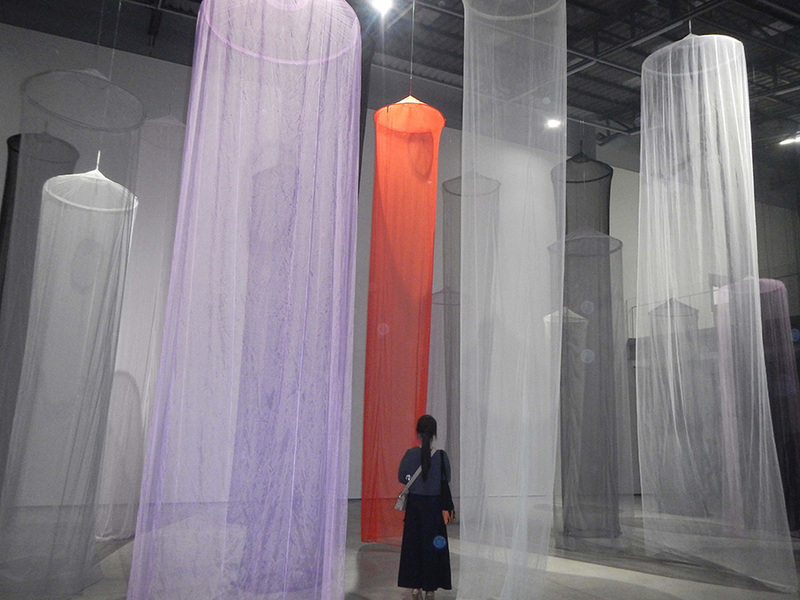 The artist said previous audiences had discussed the way the nets present a sense of spirituality and search for self. He also said he plans to expand the piece to include 50-60 nets.